This haunting picture, and its resonant title, often taken as the manifesto of the Spanish painter Goya, was the inspiration for Joan Aiken’s science fiction fantasy The Cockatrice Boys. Her magpie mind was constantly on the alert, moving between the news of the day, scientific discoveries that were changing the world, and the works of other artists and writers from the past and present, who influenced her own writing with their responses to the world in which they found themselves. 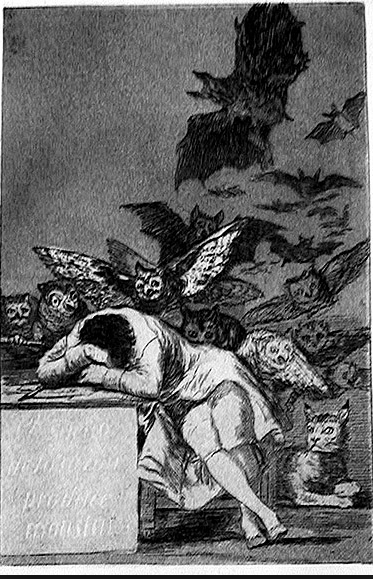 Goya’s picture shows the sleeping artist, unaware that he is surrounded by creatures of the dark, as a commentary on the corrupt state of his country before the Enlightenment of the Eighteenth century. Joan Aiken took the idea, and the imagery of the picture, and used the theme to write about one of the disasters of her day – the sensational discovery of the hole in the ozone layer above earth, nearly twenty-five years ago. 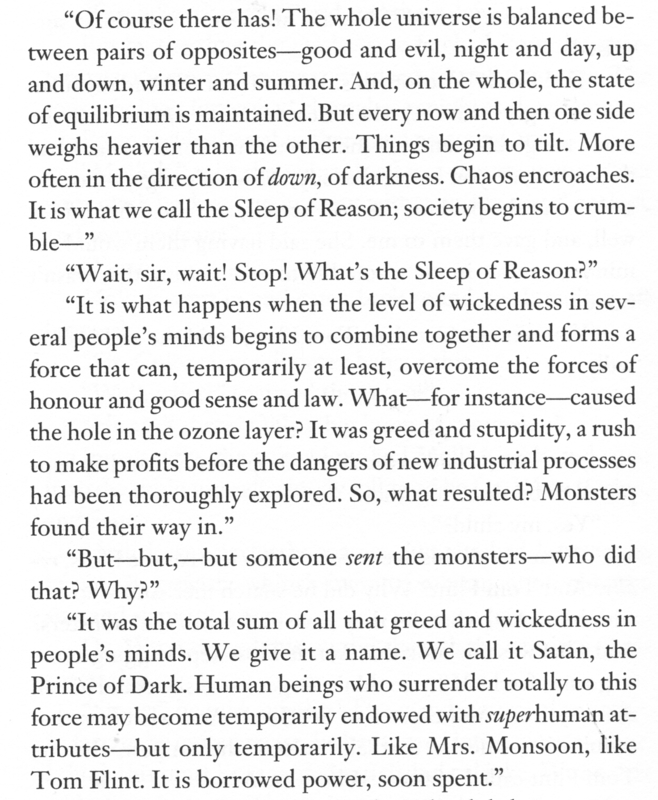 In her fantasy novel the dereliction of human awareness that led to this threat to life on our planet, leads to an invasion of monsters – the cockatrices of her story – who are descending on earth through the ozone hole as the embodiment of evil, the personification of all our weakest impulses. These days the popularity of the Dystopian novel shows that there is an ongoing need to imagine and thereby possibly prevent the destructive forces of dissonant societies carelessly or even consciously depleting the riches of the earth and destroying the future for our children. Joan Aiken, like Goya, and a new current breed of writers, believed that the power of the imagination, used alongside reason and enlightenment, can save us from our own folly, or even the power of evil. But she also believed that the opposite was true – that our failure to remain alert to dark forces, in reality as much as in the imagination, falling into Goya’s Sleep of Reason – could be equally harmful. all we have to do is stay awake…. This entry was tagged Cli-Fi climate change fiction, Joan Aiken Science Fiction, Y.A. Joan Aiken Dystopian Thriller. Bookmark the permalink. I’d not come across this before, Lizza, but I’m going to have to read it! Goya’s print seems to have inspired quite a few creative types, including Ursula Le Guin, who mentions it in her SF story Newton’s Sleep, a review of which I illustrated with the very same image (http://wp.me/p2oNj1-p6). The idea of chimerical monsters emerging into everyday life has also been re-visited by the Barrowmans’ Hollow Earth (http://wp.me/p2oNj1-55). I see in the Guardian Review that there is a sub-genre of dystopian novels involving climate change which have now, on the analogy with sci-fi, been dubbed cli-fi, though of course (as Joan’s novel testifies) the sub-genre has been around for some time. The idea of cli-fi is wonderful, is there a word for fear of weather? Joan certainly was prepared to explore every genre, though she felt this was a one off for her. Thanks Danny ( and Leinad!) Joan would have loved some of those – and been with you all the way about our truly disastrous ostrich attitude to the changing world and our part in it – perhaps ten years’ of rain (and melting ice caps) will convince? And then we’ll be able to travel from the Black Sea to the Caspian Sea again like the ancient Greeks…?